A wheel and axle is made up of a disk (the wheel) and a thin cylinder (the axle) attached to its center. When effort is applied to one, a useful effect is produced at the other. A wheeled cart can easily be moved a greater distance than trying to carry the object in your arms. This simple machine involves two circular objects — a larger disc and a smaller cylinder, both joined at the centre. The larger disc is called the wheel, and the smaller cylindrical object or rod is referred to as the axle. Sometimes, there may be two wheels attached to both ends of the axle. A wheel alone or an axle alone is not a simple machine. They need to be joined to be called a simple machine. 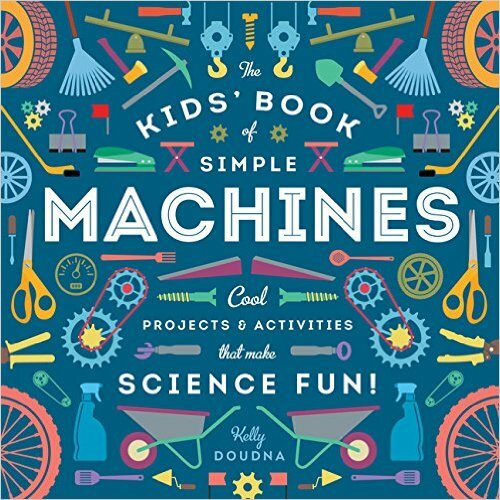 The Kids’ Book of Simple Machines: Cool Projects & Activities that Make Science Fun! Book includes: biographical spotlights on famous scientists and inventors; introduction to each simple machine, including real-world examples & history; materials & tools list; infographics; step-by-step instructions and photos; safety information; timeline; glossary; and index.